Technology has become more and more essential in the everyday functionality of the world. More jobs and areas of study require knowledge of computers and other technological equipment. What better place to foster this knowledge than in schools? 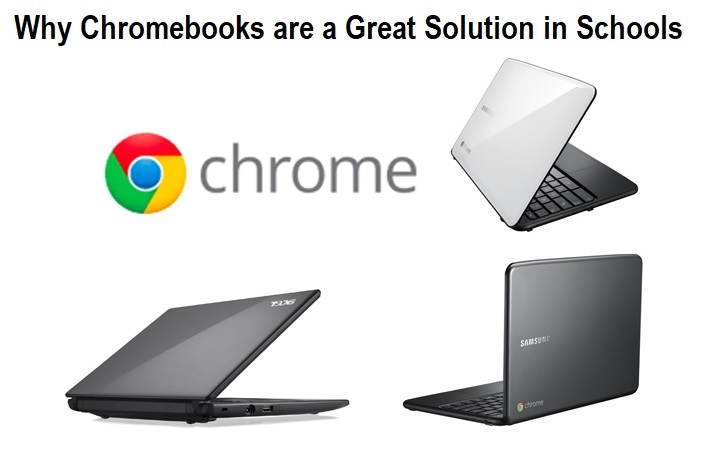 One solution to getting technology in the classroom is with Chromebooks. Compact and useful, they are an inexpensive alternative to laptop computers. If administrators are not sure about making such a big purchase for the entire school, it might be a good idea to buy a small pilot group of machines. Chromebooks can be easily stored in locking carts, which are equipped with chargers and locking caster wheels to move them from room to room. Work out a schedule so that all classrooms and all ages can have a chance to use the machines. One option is to start with the youngest kids and work up to the oldest ones. For example: Monday is the day for kindergarten to use them, Tuesday is first grade’s day, and so on. Slides, for presentations and slideshows. Drive, cloud storage and organization for files. Best of all, Chromebooks are not as expensive as a traditional laptop; starting as low as $160, they are as affordable as they are functional. Beyond a fancy toy to show off to visitors, Chromebooks are a valuable teaching tool in a school setting. There are a variety of ways that educators can use this connected device, and showing kids how to do this can open exciting new doors for them. For example, a teacher doing a unit on the African AIDS epidemic could make a live Hangouts call to a doctor in Uganda with their students. Putting these tools in students’ hands empowers them to seek out information and make discoveries of their own. Children are naturally curious, and Chromebooks are an excellent instrument to help them satisfy that curiosity. Empower the little scientists, writers and mathematicians by making technology available to them in the classroom.